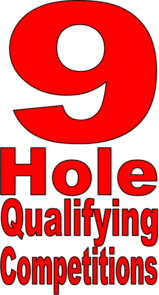 Deanwood are now able to run 9 hole qualifying stableford competitions!!! The new rules take account of peoples modern busy lifestyles and being a 9 hole course we are able to take full advantage of this. The competitions have there own handicap calculations but in essence you play 9 holes and have a neutral 18 points added to your 9 holes to make an 18 hole score. The club will be hosting regular events that you can join in with or we can arrange events just for your group/society. We will also be organising “Open” competitions so that players from other local clubs can join in. See noticeboards for event notifications. The 9 hole competitions require a different card to the normal 18 hole card because the stroke index is different as it reflects the difficulty of each hole. A copy of the cards can be seen below. To enable you to card an 18 hole score for handicapping, and in this case results purposes, all competitors are given a neautral 18 points as a back 9 score. Consequently and to take account of the obvious advantages of only playing 9 holes there is a handicap calculation specifically for 9 hole stablefords. Find a partner(s) and book your tee time in the shop or online. Enter the competition on the touchscreen in the corridor. You must have at least the entry fee amount on your club card account to enter. If you have not please deposit funds via the bar or shop till. Collect a 9 hole scorecard. Using the appropriate conversion table above calculate how many strokes you will receive and enter it on the card. On completion of your stableford round enter your score in the computer. Make sure both player and marker have checked & signed the scorecard and place it in the box under the computer outside the shop. Results will be confirmed on the website within 2 to 3 days.